Boston Terrier Gifts miscellaneous Boston Terrier Dog gifts. 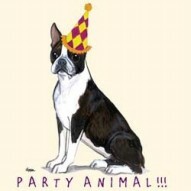 These beautiful Boston Terrier Dog Coasters will brighten up your home, yet they have a very pratical use as well. The coasters have brilliant detailed pictures of the Boston Terrier dog. 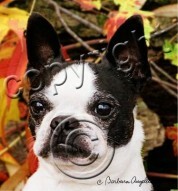 They make wonderful gifts for anyone who owns or loves the Boston Terrier dog. Great for holiday giving as well. 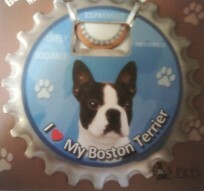 Click on the picture of the Boston Terrier coaster to see a larger image of the gift. This beautiful Colorful Boston Terrier Dog Coaster Set has 4 coasters with a colorful image from the Barbara Augello Collection of the Boston Terrier dog head on them. Made of cloth faced neoprene. Size: 4" x 4" square. 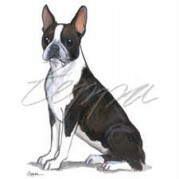 A Gorgeous Boston Terrier Sitting Portrait by famous dog artist M.K. 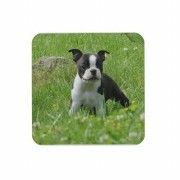 Zeppa is Dye sublimated directly into rubber backed polyester material to make the Absorbant boston Terrier Coasters. The poly is absorbent enough to make great coasters and the rubber helps to resist slipping. Coasters measure 4 by 4 inches and come packaged 4 to a clear reseal-able bag. To clean, simply wipe with a damp sponge. A great gift!